Helen Hunt took on the red carpet of the 24th Annual Palm Springs International Film Festival held at the Palms Springs Convention Center in California on Friday. She wore a dark-navy Michael Kors Spring 2013 halter gown. The jersey gown was styled with Rene Caovilla shoes, a Charles Albert wrist cuff, London Manori earrings, and H. Stern rings. Glitz is mandatory at an awards gala, right? To comply, Helen carried a blue Swarovski ‘Power’ clutch. The floor-length gown complements Helen’s lean figure beautifully, and I adore the twisted fabric detail in the front. I also really like that she kept the look clean and simple with soft wavy locks and neutral makeup. The combination made her look effortless and natural. 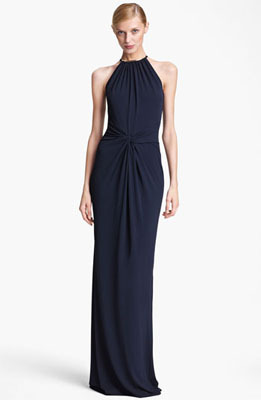 You can buy Helen’s Michael Kors gown from Nordstrom.com.